By the time Gram Parsons had started his solo career in 1972, he had already left his mark on music, whether you call it "country-rock", "alt-country" or Gram's preferred description "cosmic American music". In the years between 1967-1969, he was involved in the making of three classic albums with three different groups! The 1968 release of "Safe At Home" by the International Submarine Band is arguable one of the first country-rock albums. Two tracks from this album were selected by the Country Music Foundation for inclusion in The Greatest Country Music Recordings of All Time. However, by the time the album was released in 1968, Parsons had already joined the Byrds. His album with the Byrds, "Sweetheart of the Rodeo" is considered one of the best rock albums of all time. Within another year, Parsons had recorded another classic album, this time with the Flying Burrito Brothers' "Gilded Palace of Sin". Both these albums by the Byrds and the Burrito's constantly make the lists of most influential albums of rock 'n roll. Gram didn't start his solo career until 1972, eventually releasing the "GP" album in early 1973. While it received some good reviews, it did not sell. Nonplussed, Gram went on tour to support the album in 1973. A posthumous live album was released in the eighties, and one of the songs from the album, "Love Hurts" was nominated for a Grammy in 1983. In the summer of 1973 Gram recorded his second solo album. When the sessions ended and he was happy with the results, he went to celebrate at one of his favorite party places, the Joshua Tree monument. Gram died there in September from a combination of alcohol, prescription medicine and (some say) morphine. Although the album cover artwork had already been approved of by Gram, his wife thought the cover was in bad taste and had it replaced when Gram's posthumous "Grievous Angel" was finally released in early 1974. But, other than the cover, is this the solo album that Gram Parsons intended? Well, that's what we talk about in this installment of "rock 'n roll case study". Right: The original intended album cover concept for "Sleepless Nights". When Gram Parson’s second solo album was released posthumously in 1974, it had a different album cover than the cover that Gram had already approved. 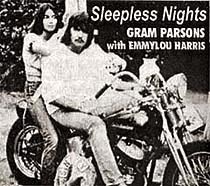 The intended album cover was a photograph of Gram and Emmylou sitting on Phil Kaufman’s Harley. A “Sin City” jacket is also placed on the foot peg of the bike. The jacket was a reference to the Flying Burrito Brother’s song and was given to him by fans on the recent Fallen Angels tour. Gram’s wife, Gretchen, was already jealous of the working relationship (purely platonic I might add) that Emmylou Harris and Gram had. As a widow, Gretchen decided to change the album cover for Gram’s second solo album. She found the picture of Gram and Emmylou on the Harley “offensive” and pressured Warner Bros. to change the album cover to another picture taken by photographer Ginny Winn. Although the album cover was changed, the “offending” photograph (also by Ginny Winn) eventually made it into Rolling Stone magazine in 1974. Right: GRIEVOUS ANGEL - the album that was released after Gram's death. We’ve talked about the cover of the album, but what about the music? We know that the sessions produced twelve songs in all: “Return of the Grievous Angel”, “Sleepless Nights”, “Brand New Heartache“, “I Can’t Dance”, “Cash On The Barrelhead”, “Love Hurts”, “In My Hour Of Darkness”, “The Angels Rejoiced”, “$1000 Wedding”, “Hearts On Fire”, “Las Vegas” and “Brass Buttons”. Nine of these ended up on the posthumous album, GRIEVOUS ANGEL (1974) and three were found on the compilation album, SLEEPLESS NIGHTS in 1976. Since all of the songs from Gram’s last recording session have been released, would Gram’s intended album have been any different? Gram’s widow took over administering the details of the final recording. She not only changed the title/cover but is probably the reason for reducing the number of cuts featuring Emmylou. I think album probably would have had 10 cuts. For one thing, there is the title of the album. After completing the album, Gram called his sister in Tennessee, saying, “GP's okay, but Sleepless Nights is a Lot more like what I want to accomplish". That pretty much means that the song, “Sleepless Nights” was to be included, especially if it was the title of the album. There is another cut from the session that Gram wanted to hold for his following album. That song was “The Angels Rejoiced” and according to Emmylou Harris Gram said that he “wasn't going to put in on the album, that it would go on his next album.” He said, "it'll go on the next one, there are enough songs about angels on this one." That leaves “Brand New Heartache” as the last remaining “lost” track from the session, but I could find no references by Gram about this song. However, since there were already two songs by F. & B. Bryant (“Love Hurts” and “Sleepless Nights”) I doubt that Gram would have included a third by the same songwriter (“Brand New Heartache”). Besides, most artists record more than they need for an album, and Gram was already holding “The Angels Rejoiced” for another album. So, there you have it. Since Gram left no specific instructions for (what became) his last album, we can only speculate. I like making my own version of “lost” albums, whether it be the Beatles “Get Back”, the Beach Boys “Smile” or the Kinks “Four More Respected Gentlemen”. Although in Gram’s case not all 12 tracks would have made the final cut for SLEEPLESS NIGHTS, my own cassette includes all the songs from Gram’s final session. It is fun to listen to and ask yourself, “what if”?